Finally a great humbucking replacement for your ASAT! Modelled after our long running, ever popular Tallboy humbucking, this version for ASAT creates a wider range humbucking sound and will split to single coil mode with lots of quack and brilliance. Just what we've all been waiting for. Coils are staggered so that you get accurate string alignment of the polepieces. Comes with 4-conductor cable. 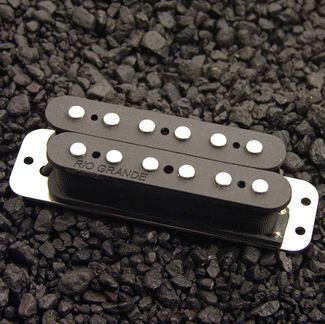 Finally a great humbucking replacement for your ASAT! Modelled after our long running, ever popular Tallboy humbucking, this version for ASAT creates a wider range humbucking sound and will split to single coil mode with lots of quack and brilliance. Just what we've all been waiting for. Coils are staggered so that you get accurate string alignment of the polepieces. Comes with 4-conductor cable. I swapped this out for the bridge pickup on my ASAT special. Holy smokes. It's louder, it's a total beefcake, and it's a real tone machine. The coil tap is also impressive. You get a solid single coil out of this too. If I had to nit pick, I'd say that this pickups could be made perfect if the dip in volume when switching to the single coil is addressed. I know that's a common thing with coil tapping. I can't think of any other critique. This thing supercharged my G&L. I wish I knew the stats. I'm curious as to the output rating.